Repeatedly, the mother of Frank and Jesse James seated her sons in front of the evening fire to drill them in their family heritage. With so little to tell, she only could have wished to have 35 shades of the James coat of arms to show her sons. Over and over, Zerelda Elizabeth Cole-James made a point of saying to her boys, “Never forget. You are descended from Royalty.” However, Zerelda never could say how that occurred. Nor could she provide her sons with any proof or evidence of what royal and to whom they were related. So, she referenced King James of England. A James coat of arms to display to her children might have helped. In her childhood, growing up in Woodford County, Kentucky, many wealthier neighbors of young Zerelda possessed a family coat of arms. The coat of arms they proudly presented or displayed was a relic, long held since family ancestors broke rank with the mother England in the American Revolution. Some possessed their coat of arms longer, for generations before. Such was not the case for the Cole family to whom young Zerelda was born. 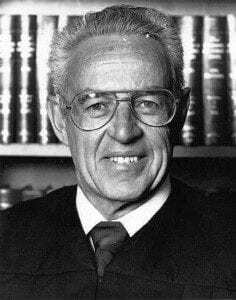 However, as a teenager when Zerelda seized upon an upstart preacher named Robert Sallee James, she knew what everyone knew about his James family. The James descended from high stock. If Zerelda married that Georgetown College student with all his family connections and a bright career in ministry before him, she could escape her hardscrabble life as a servant girl in her family’s roadhouse ordinary. Zerelda could rise on the economic scale. And when she bore Robert children, her children would descend from royalty, too. The prophecy always began with Ma’s description of those who had migrated to the Virginia colony in the early years…Many in the Virginia colony were running from something or somebody. Outcasts, robbers, bandit, bastards and the like were the backbone of the Virginia colony. 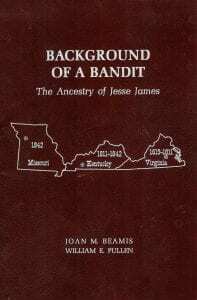 In 1970, Joan Malley Beamis published the first genealogy of the Jesse James family, Background of a Bandit. Joan is a first cousin of Frank and Jesse, and a great-granddaughter of their uncle, Drury Woodson James. Joan discovered no royal coat of arms for her James family relatives to claim. Joan further ascertained that William James is the immigrant of the James family, and John was his son. Nearly fifty years later, Investigation of Joan’s research files revealed her personal doubt about the genealogy she wrote and published. Joan wrote that, for lack of evidence, she still questioned whether William was the immigrant at all. Too many James families occupied the Virginia colony just before the Revolution. 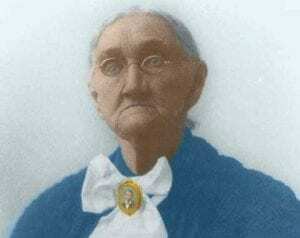 For all of them she deduced, the James family might have been in America for generations earlier. The family, too, might have been much larger than she alone could establish. Twenty years of new research since reveals the immigrant John James, an arrival in America in the year 1620. 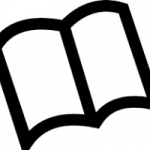 Stray Leaves began publishing this genealogy in 1997, subjecting new research findings ever since to rigorous peer scrutiny on a worldwide basis. Today, the known, documented and established results of these conclusions support Joan’s doubt. They also disclaim Ma Zerelda’s family lore about King James. Although the land the James family acquired in Colonial Virginia was granted through Alexander Spotswood from Charles II, a grandson of James I, King of England, no other kinship link to King James can be established. 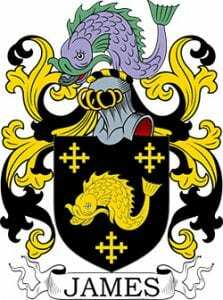 However, through generations of royal courtiers, none bearing the James name, the lineage of Frank and Jesse James indeed can be traced back to their 19th great-grandfather King Edward II of Caernarvon, Wales and beyond. The boys also are descendants of the Plantagenet Kings Edward I, III, and IV, as well as King Henry VII of Pembrokeshire, Wales. Seeking what coat of arms the Jesse James family might claim, Stray Leaves consulted the eminent coat of arms website, derived from the ancient and reliable records of Burke’s Peerage – coadb.com (Coat of Arms Database). 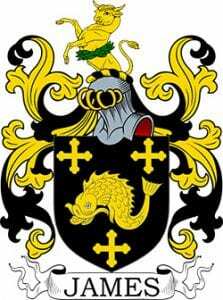 There, on a page specifically devoted to the James surname, were found more than 35 shades of the James coat of arms. Selecting which coat of arms might apply became an exercise in historical knowledge. Apparently, coats that reflect James of Irish origin were eliminated promptly. Next eliminated were those that reflect nothing relating to what is known of the documented history of the James family in America. What remained are the two coats of arms that reflect Pembroke, Wales and Somerset, England. From the study by Joan Beamis, she claimed that William James was an immigrant from Pembrokeshire, Wales. However, in the fifty years of additional research since, no link with Pembroke, Wales or any James family history can be established from Pembrokeshire. “The reason I was asking was that every so often someone turns up to research the ‘Welsh ancestry’ of the James family, but we have never found any evidence to support the theory at all, at least it is so for west Wales, I can’t answer for north Wales. But, I am not surprised, as in the wealth of supposed James family history to be found there is a dearth of evidence to support the supposed eighteenth-century ancestors. What remains to consider are these two coats of arms from Somerset in England. 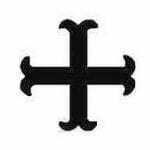 The black background common to both crests symbolizes grief and resistance, powerful emotions that continue to infuse James family members today. The fish that graces the crest represents bravery and steadfastness. Moreover, the fish also accounts for Christian faith, constituting a genuine, generous spirit. The fish also represents economy and science. In the one, the bull replicates bravery and generosity. Its horns replicate strength and fortitude with undertones of patience, humility, and sacrifice connected. The bull topping the crest may represent the landed gentry while the dolphin at the top may represent seafaring gentry, as well as swiftness, diligence, charity, and love. It is believed that John James the immigrant arrived in America from Wales as a captain with a ship of his own. 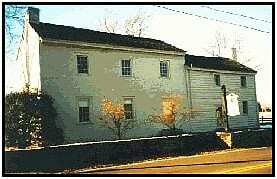 The family’s founding of Somerset in Pulaski County, Kentucky evidences the James family’s continued strong tie to its ancient motherland. King Edward II of Caernarvon, Wales, and his father Edward I known as Longshanks, present crests of royal heritage. Variations of the crest have been adopted by royal courtiers and extended family, all of whom appear in the ancestry of the James family. If the James family adopted a coat of arms for use in the contemporary era, the coat would have to reflect the fundamental character, personality, behavior, and soul, which the James family typifies. 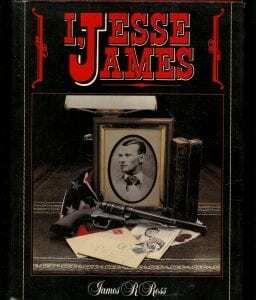 That panoply of character now is documented and appears in the family’s official biography Jesse James Soul Liberty. A modern crest for the James would have to include escutcheons for education, faith, and service to community. Ironically, these are the modern equivalents of service once provided by kings and courtiers. 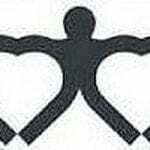 The passage of several hundred years may have caused the use of a coat of arms to fade into past glory and romance. There remains, however, the modern equivalent. Being descended from royalty, as Ma Zerelda instructed her sons Frank and Jesse James, still carries the burden of social responsibility, protection, and defense for living a peaceful, productive, and beneficial life for both one’s self and community. Hey, Jesse James family, you still do what is necessary, but what will you be wearing on your tee shirt now?